Jonathan Fishman, Edward Fisher, Musheer Hussain,	The Journal of Laryngology & Otology, Volume 132 Issue 10, p 857. W L Crutcher, P Tassone, S Pelosi,	The Journal of Laryngology & Otology, Volume 132 Issue 10, pp 858-865. L Harrison, A Kundra, P Jervis,	The Journal of Laryngology & Otology, Volume 132 Issue 10, pp 866-871. D Schwarz, P Wolber, M Balk, J C Luers,	The Journal of Laryngology & Otology, Volume 132 Issue 10, pp 872-874. Y Quan, X J Gao, J Liu, R Z Gong, Q Wang, H Liang, J L Fu, Q Cheng,	The Journal of Laryngology & Otology, Volume 132 Issue 10, pp 875-880. O McLaren, E C Toll, R Easto, E Willis, S Harris, J Rainsbury,	The Journal of Laryngology & Otology, Volume 132 Issue 10, pp 881-884. L Zhao, J Li, S Gong,	The Journal of Laryngology & Otology, Volume 132 Issue 10, pp 885-890. A Ekinci,	The Journal of Laryngology & Otology, Volume 132 Issue 10, pp 891-895. A I Mallinson, N S Longridge,	The Journal of Laryngology & Otology, Volume 132 Issue 10, pp 896-900. A Noor, L Stepan, S S-T Kao, N Dharmawardana, E H Ooi, J-C Hodge, S Krishnan, A Foreman,	The Journal of Laryngology & Otology, Volume 132 Issue 10, pp 901-905. N S Longridge, A I Mallinson,	The Journal of Laryngology & Otology, Volume 132 Issue 10, pp 906-910. H K Tolska, A J Takala, J Jero,	The Journal of Laryngology & Otology, Volume 132 Issue 10, pp 911-922. A A K Abdel Razek,	The Journal of Laryngology & Otology, Volume 132 Issue 10, pp 923-928. Internal carotid artery aneurysm in skull base osteomyelitis: does the pattern of cranial nerve involvement matter? F Hassannia, S D Carr, E Yu, J A Rutka,	The Journal of Laryngology & Otology, Volume 132 Issue 10, pp 929-931. B Shaw, R S Raghavan,	The Journal of Laryngology & Otology, Volume 132 Issue 10, pp 932-935. M Ally, A J Kinshuck, A Sandison, G S Sandhu,	The Journal of Laryngology & Otology, Volume 132 Issue 10, pp 936-939. P M Puttasiddaiah, C R Whittet, G N Shuttleworth,	The Journal of Laryngology & Otology, Volume 132 Issue 10, pp 940-942. 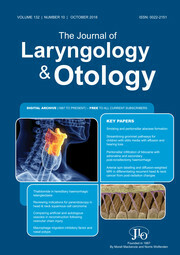 W J C Leong, H W Yuen,	The Journal of Laryngology & Otology, Volume 132 Issue 10, pp 943-945. J Rebol, M Kravos, M Ložar,	The Journal of Laryngology & Otology, Volume 132 Issue 10, pp 946-948. The Journal of Laryngology & Otology, Volume 132 Issue 10, p 950.